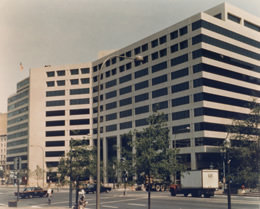 1201 Pennsylvania Avenue office building by Miller & Favazzo Properties - quality real estate development and property management. 1201 Pennsylvania Avenue, Washington, D.C.
shaped building was one of the first buildings built in the redevelopment of Pennsylvania Avenue. The dramatic design by the Washington D.C. office of Skidmore, Owings, and Merrill includes an eight-story landscaped atrium. It was the headquarters for Covington & Burling, one of Washington's leading law firms.